bb7 will be abuzz on Tuesday, August 2nd, 2016 when we host a swarm of bee aficionados, The Madbees. bb7 welcomes the The Dane County Beekeepers Association (DCBA) aka The Madbees, and all those interested in learning more about beekeeping and bees. Please join the group on Tuesday, August 2nd at 6:30pm. Part of the agenda will be a discussion regarding hives at the workplace. bb7 is a unique work space with several active hives! Each year, we harvest the honey to create a limited-edition honey treat. Past honey-infused delicacies have included honey rye beer and honey whiskey. Bees are an homage to our name (get it? ), and the beehive represents our collaborative style. 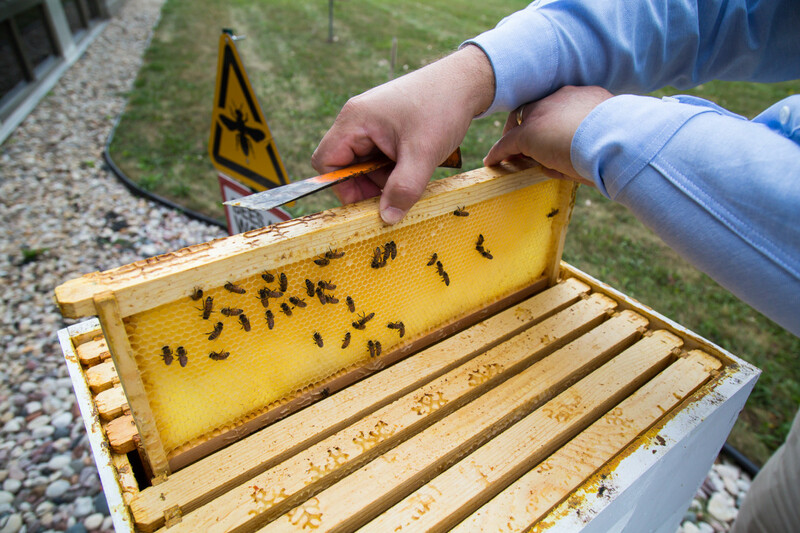 Just like our hives, bb7 is buzzing with a group of organized and industrious team members. Just like bees, we work together towards one goal: to produce something rewarding. Please contact Peter Davis, our resident beekeeper (and Mechanical Designer) if you’d like to attend. All are welcome.